The study described in this PhD thesis, is the first that investigates the relationship between language knowledge, listening comprehension, and automatisation of spoken word recognition among adult learners of a second language (L2). (ii) focus on higher order strategy. 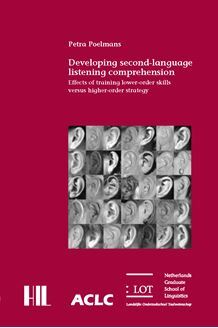 Although the results are not so straightforward that recommendations are made towards a change in the teaching of L2 listening skills, the thesis draws conclusions that are of interest for both educationalists and researchers. For example, the results show the usefulness, or even the necessity, of using time­critical tests for compiling detailed language profiles of second language learners. With respect to the notion of automatisation, the results contribute to the idea that automatised and controlled processes do not form a dichotomy but that there is a continuum between the two extremes. The detailed description of the tests and training-exercises that were used offer a wealth of information both for researchers and language teaching professionals.